Mike is a native of Hanover County, Virginia. He has a strong passion for chasing whitetails and turkeys across the Old Dominion. His early years were spent produce farming with his grandfather, who taught Mike how to work the soils. 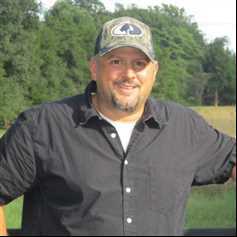 He currently enjoys creating food plots and wildlife habitat. After being in the HVAC trade for many years, he began his Real Estate Sales and Real Estate Appraisal career over 15 years ago in central Virginia and the Northern Neck. Mike grew up in Hanover County, Virginia, and now resides in King William County with his wife Crystal and three children. They are active in sports and also enjoy spending time on the farm and in Stingray Point, Virginia. Somewhere between working and hunting you will find Mike on the waters of the Chesapeake Bay and tributaries fishing for Cobia, Specks, Redfish and Rockfish. Mike especially likes getting the chance to hit some farm ponds and Chickahominy River for Bass. Mike’s extensive knowledge and enthusiasm of these areas make him an excellent fit for the Mossy Oak Properties/NC Land and Farms team. He brings a lifetime of experience as an enthusiast in farming, hunting and fishing, and his passion for this area will be unmistakable when you meet him.